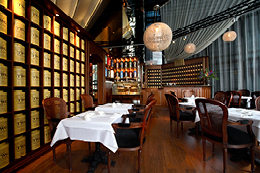 TWG Tea is the premier tea supplier to the finest hotels, restaurants and international airlines around the world. It is available in gourmet sections of luxury retailers worldwide and has its own tea counters in Harrods Knightsbridge, London. The Tea Chest stocks an extensive selection of TWG Tea products that are specially conceived for the hospitality industry. From loose teas that require brewing at the back of house to hand-sewn 100% cotton tea bags for the in-room enjoyment of hotel guests, to beautiful artisanal tins of loose leaf teas that make unforgettable gifts and various tea accessories. With the support of TWG Tea and their unsurpassed selection of only the highest quality products, we ensure that all your tea drinking moments are made exceptional. We are truly passionate about tea and believe that goes hand-in-hand with knowledge. We will be happy to support you with tea tastings, food and tea pairings as well as tea training for your staff. You can download more detailed information on our product range here.